"Where the North American St. Nicholas Revolution Began"
Dr. Raymond Guarendi (above, right), host of the popular series, “Living Right with Dr. Ray,” prepares to conduct a rare interview with St. Nicholas of Myra (a.k.a. “Santa Claus”). The 4th century saint arrived donning his Eastern Christian (Byzantine) Bishop’s vestments. 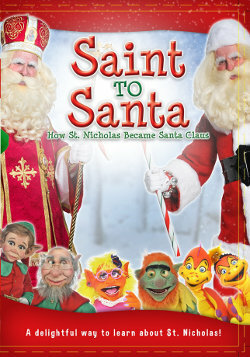 Join clinical psychologist, Dr. Raymond Guarendi and his LIVE studio audience as he conducts a rare television interview with St. Nicholas during his “Living Right With Dr. Ray: Christmas Special.” His program is viewed globally in more than 140 countries each week on the Global Catholic Television Network (EWTN). The interview with Dr. Ray discloses that, far from living in “a marshmallow world,” Nicholas was no stranger to persecution and suffering due to his steadfast devotion to his Christian Faith. 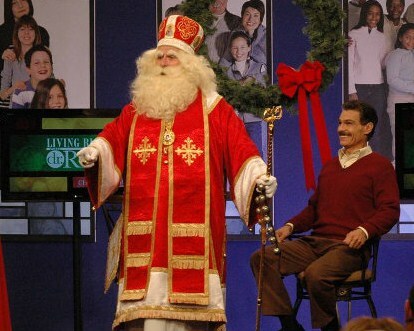 Despite the tyranny he endured under the pagan Roman authorities of his day, however, St. Nicholas’ welcoming, avuncular persona still shines through; exuding the same joy, peace and love that continues to make him the embodiment of all that is the “Christmas Spirit” now, and for all time.